Wondering what goes where? Use the following information as a guide to everything that can be recycled or composted on campus. For information about recycling items off campus, please consult the BC Recyclepedia. Notice something that needs updating? If aerosol cans are completely empty, and do not contain any toxic residue, they can go in the Recyclable Containers (grey) bin. Clean aluminum foil and aluminum pie plates can go in the Recyclable Containers (grey) bin. If the foil is dirty (i.e. contains food residue) then it must go in the garbage. Small appliances with plugs such as microwaves, toasters, and kettles can be handled through the e-waste program (see "Electronic Waste" tab below) if they no longer work. If the unit is working but no longer needed, list it on Reuse-it! UBC. Large appliances such as refrigerators, freezers, dishwashers, and stoves are collected by Building Operations for recycling on request. Please place a service request using PeopleSoft Financial Management System (FMS) or contact your Facilities Manager. If the unit is working but no longer needed, list it on Reuse-it! UBC. Note: older (i.e., pre-1993) refrigerators and freezers can often be energy-intensive so it may be better to retire them. If a recycling symbol appears anywhere on the packaging, then this can go in the Paper (blue) bin. The Battery Recycling Program is a partnership between Risk Management Services andCall2Recycle, created to recycle non-rechargeable batteries, rechargeable batteries and cell phones for free at UBC. There are numerous drop off locations across campus, or you can set up your own box. Do NOT include electronic waste or small appliances, as these are not acceptable! Do not store batteries for long periods of time and aim to ship off your boxes regularly. As of 2018, all new Call2Recycle collection boxes contain a flame retardant liner to increase safety in storage and transportation. Await arrival of your new Call2Recycle box in 3-4 weeks, fulfilled as part of the auto replenishment process. Binders and folders made of vinyl or other kinds of plastic cannot go in any of the recycling streams and are therefore garbage. If in decent condition, you can post items on Reuse-it! UBC. Hanging paper file folders can go in the Paper (blue) bin. Ink and toner cartridges are part of BC’s Extended Producer Responsibility (EPR) Programs. Return your empty ink and toner cartridges to the place of purchase, or inquire with stores near you. The UBC Bookstore recycles printer ribbons and cartridges. Items can be dropped off in the computer shop department. Keep the box of your new cartridge. Put the old cartridge in. Mail back to place of purchase or have your supplier pick up old cartridges when dropping off new ones. See also the UBC Sustainable Purchasing Guide- Printing. Used cell phones can be recycling through Risk Management Services Battery Recycling Program. Christmas trees can be recycled through the UBC Botanical Garden's Christmas tree recycling program from late December to early January. Drop off your Christmas tree to be chipped into mulch that will be used on UBC Botanical Garden trails. This service is by donation, with donations supporting educational programs in local schools. For more detailed information including dates, hours and locations, visit the UBC Botanical Garden in December. All coffee cups on campus can now be recycled! Place empty cups and lids – with the sleeves removed – into the Recyclable Containers (grey) bin. Do not put liquids into the bin. Cardboard and paper sleeves can be placed in the Paper (blue) bin. The best option is to bring your own mug. When you do so, you will receive a 15 cent personal mug discount at all UBC Food Services outlets, at AMS food outlets in the Student Union Building (SUB), at Starbucks and at Bean Around the World. Note: Compostable equivalents are available! It is best to purchase compostable k-cups, which can then go into the Food Scraps (green) bin. If CDs, DVDs or old floppy disks do not contain sensitive or private information, they can be recycled. Place a service request through Waste Management for pickup of CDs/DVDs and cases. Please separate CDs/DVDs and their cases. Paper inserts can be recycled in Paper Recycling (blue) bins. Only compost bags that are made of paper/fibre are acceptable in UBC's food scraps (green) bin. Plastic-like bags labelled compostable, degradable or biodegradable CANNOT be processed in UBC’s composting system. Please keep all types of plastics out of the Food Scraps bin. Food scraps and food-soiled paper such as napkins and compostable paper food packaging can be composted through the Food Scraps (green) bin at campus-wide recycling stations. Please keep all types of plastics out of the Food Scraps bins – even plastic labelled compostable, degradable or biodegradable. Plastics are not compatible with UBC's Composting Facility. Learn more here. UBC Building Operations offers a competitively priced Confidential Shredding service for confidential documents. To make arrangements for confidential shredding, please contact your Facility Manager or call the Building Operations service center at 604-822-2173. Documents for confidential shredding should be stored in a closed box in a secured location for pick up. Glass bottles, jars, pop cans, metal cans, plastic containers and bottles, juice boxes and milk cartons can be recycled in the Recyclable Containers (grey) bin. Empty coffee cups and lids are now recyclable in the Recyclable Containers (grey) bin. Please remove the paper sleeves an dplace the sleeve in the Paper (blue) bin. For further information on which containers can be recycled, visit the Sort it Out page. Please place all corrugated cardboard in large green "cardboard only" bins located around campus. If your department or building does not have one of these large bins, simply place flattened cardboard next to the garbage dumpsters for pick up. TIP: You can recycle your clean pizza box! Simply place clean parts of the box in the cardboard recycling bin, and soiled greasy parts in the garbage. UBC’s composting facility cannot currently process cardboard. UBC Waste Management operates the Deskside Recycling program that consists of a large blue bin for paper recycling and a miniature black garbage bin as an attachment, which are placed at individual workstation units across campus. Work station occupants are responsible for emptying their deskside bins into larger garbage and blue tote or multi-stream recycling bins, usually located in main hallways. Disposable gloves are garbage--They are not accepted in the UBC recycling programs. Alternatively, TerraCycle offers an off-campus recycling program for nitrile and latex gloves. UBC's E-Waste Recycling Program collects and responsibly recycles campus electronic waste or e-waste, which includes old, broken or obsolete cell phones, computer towers and monitors, keyboards and computer mice, scanners and printers, projectors, television sets, video cassettes, electronic scientific equipment, etc. Campus community members can drop off their departmental e-waste and personal e-waste at the University Services Building, Room 0150, Monday to Friday, between 7:30 a.m.–3:30 p.m.
Departmental e-waste collection can be arranged through department Facilities Managers. Event organizers need to plan for recycling and composting bins appropriate to the type of event and amount of waste generated. Refer to the Zero Waste Events Guide for information on requesting bins, and how to reduce event waste. Glass containers such as pop bottles and jars can be recycled in the Recyclable Containers (grey) bin at campus-wide recycling stations. Laboratory glass must be decontaminated via approved procedure and sent to the landfill for disposal. Please refer to the Hazardous Waste Disposal Guide for more information. UBC is currently investigating options to recycle decontaminated, non-hazardous lab glass. Refer to the Hazardous Waste Disposal Guide from Risk Management Services for the following substances: Asbestos Waste; Biological Waste; Chemical Waste; Non-Regulated Contaminated Solid Waste; Oil Waste; Photographic Waste; Radioactive Waste. Some plastic containers can be recycled through the Laboratory Plastic Recycling Program. Note: UBC is looking for volunteers from departmental labs to help expand Lab Plastic Recycling. Registration is simple and the time commitment is minimal. 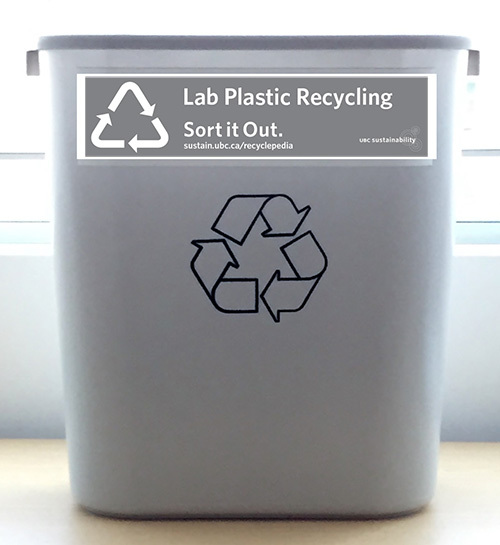 Sign up now to help your lab recycle! Education – Inform your co-workers and create awareness about the program and guidelines. Collection – Ensure only accepted plastic is recycled. Transferring – Coordinate the transfer of full collection bins to large UBC plastic recycling bins. Questions? Review our FAQ (PDF). UBC Waste Management recycles light bulbs on campus. Please contact your building's Facilities Manager if you have light bulbs to recycle. Empty milk cartons can be placed in the Recyclable Containers (grey) bins. Single serve milk or cream containers with peel-off lids are acceptable in the Recyclable Containers (grey) bin if it has number 1-6 on it and the lid is removed. UBC collects surplus, non-industrial paint for recycling. For full details, please visit the Paint Recycling program webpage. Paper products, including newspapers, magazines, envelopes, copy paper, cup sleeves, cereal boxes, telephone books, and sticky notes can be recycled in the Paper (blue) bin. For more information on what items are recyclable on campus visit the Sort it Out page. Plain paper/cardboard food boxes for take-out can be put in the Food Scraps (green) bin for composting. Note, if containers have a plastic/wax coating on the inside, they must be certified compostable; otherwise they should be placed in the garbage, as they are non-compostable and not recyclable when soiled. Clean cardboard can be placed in cardboard recycling bins which are typically located at loading dock recycling areas of most buildings, or in recycling rooms in residences. Soiled cardboard should be placed in garbage as it is not recyclable, and corrugated cardboard is not compostable in UBC’s composting system. Pharmaceutical waste is sent for disposal as hazardous waste through the Environmental Services Facility (ESF). For more information please contact the Environmental Services Technician at 604-827-5389 or refer to the Hazardous Waste Disposal Guide. Photography paper cannot be recycled (as it is coated with chemicals that may cause contamination) and must be put in the garbage bin. Plastic bags (a type of soft plastic) are NOT currently recyclable at UBC’s recycling stations. If your department is interested in recycling soft plastics, UBC Building Operations runs a soft plastic collection program and has various collection locations across campus. Visit this website for more information. All bags and soft plastics must be empty, clean and dry. Tip: recyclable soft plastics tend to have some stretch. Plastics with other materials attached, such as metal, paper, wood, Styrofoam or other hard plastics. Please remove labels when possible. Tip: Crinkly plastic without any stretch is not generally recyclable. Many retail outlets such as London Drugs also have plastic bag recycling programs. Large, woven bulk bags known as Flexible Intermediate Bulk Containers (FIBC), bulk bag, or big bag, are industrial containers made of flexible fabric that is designed for storing and transporting dry, flowable products, such as sand, soil or other materials. If available in sufficient quantities, these bags (when clean and dry) can be consolidated together, packaged and collected by UBC Waste Management for recycling, similar to collection of soft plastics. However bulk bags must be packaged separately from other soft plastics. Contact UBC Building Operations for more information. Plastic containers with marked numbers 1-7 (also known as hard plastics) can be recycled in the Recyclable Containers (grey) bins at recycling stations across campus and in offices. Please place all unmarked plastics in the garbage, these cannot be recycled at UBC at this time. For more information on types of containers accepted, visit the Sort it Out page. The white fabric should be removed from the metal part, and put into the garbage. The metal pieces can be put into the scrap metal recycling. This scrap metal can be picked up by UBC Waste Management by putting in a service request, either through PeopleSoft or by contacting your Facilities Manager. Photographic waste containing greater than 5 ppm of silver is considered hazardous waste and is prohibited from entering the sewer system. Refer to the Silvery Recovery Program for information on proper handling and disposal. Styrofoam is NOT recyclable at UBC’s recycling stations. Consequently, Styrofoam packaging (such as food trays) should be avoided wherever possible. As Styrofoam is sometimes unavoidable in equipment shipping, UBC Waste Management provides Styrofoam collection at select locations on campus where generation of Styrofoam waste is significant. For these locations, Styrofoam must be collected by building staff or users in large clear bags which can be purchased through Building Operations, and placed at the loading bay recycling area for collection by UBC Waste Management on scheduled days. If your department or building would like to participate in the Styrofoam collection program, contact UBC Building Operations for more information. There are various ways to reuse or recycle textbooks before deciding to throw them into the blue Paper bin. UBC Bookstore runs a textbooks buyback program. They also work with Books for Africa, a non-profit organization that ships textbooks to Africa. You can donate unwanted books to this program and the bookstore will ensure that they continue to be of use to students in developing nations. You can also check out the used books classified ads, as well as other local pages like Craigslist Vancouver. Overhead transparencies (plastic #1) can be recycled in the grey Recyclable Containers bins at recycling stations across campus.